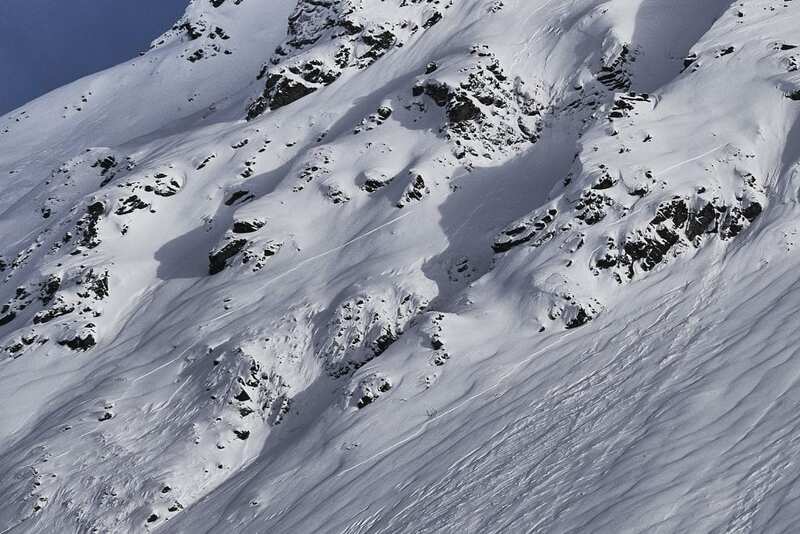 A MODERATE avalanche hazard exists for persistent slab avalanches at mid to upper elevations, on a variety of aspects, 1-3 feet deep, on slopes 35° and steeper, and may be large enough to bury, injure or kill. Human triggered avalanches are possible and natural avalanches are unlikely. Remotely triggered avalanches will be possible on connected slopes, adjacent terrain, and from the flats below. This is a low probability, high consequence hazard. A LOW hazard exists at low elevation. It’s a low probability, high consequence situation. Currently weak layers buried in the snowpack are gaining stability, which means it will be less likely to trigger avalanches, but the consequences of triggering an avalanche will be high. We have a complicated snowpack situation, an unreliable snowpack structure, and we are only days out from a slew of avalanches. Stability has increased and natural avalanches are unlikely, but human triggered slab avalanches are possible and will be large enough to bury, injure or kill. Remotely triggered avalanches are possible from the flats, connected slopes, or adjacent to steep slopes. Persistent slab avalanches exist at mid-upper elevations, on slopes generally 35° and steeper, on all aspects, but will be deeper and more consequential on leeward aspects, West to North. This season’s snowpack is a fickle beast. Here’s this week’s avalanche rundown and why we should all continue to be cautious if we head into the backcountry this weekend. Weak layers buried both in the mid-pack and near the ground were overloaded this week from recent new snow and moderate wind loading. Avalanches were both human triggered and naturally triggered. 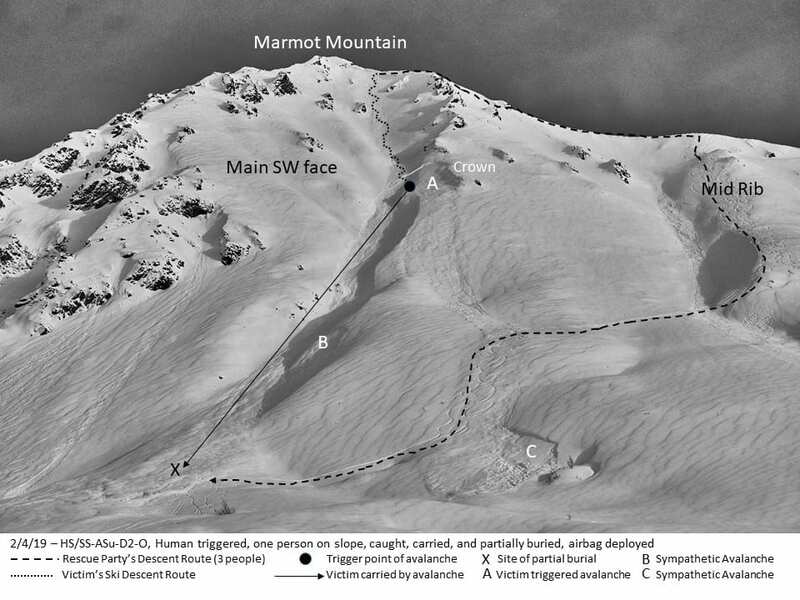 On Monday, 2/4, within 24-48" hours of an 11” dump of snow, a human triggered avalanche on the SW face of Marmot partially buried a skier, failing about 1-2’ deep, 75’ wide, and running about 1000 feet. 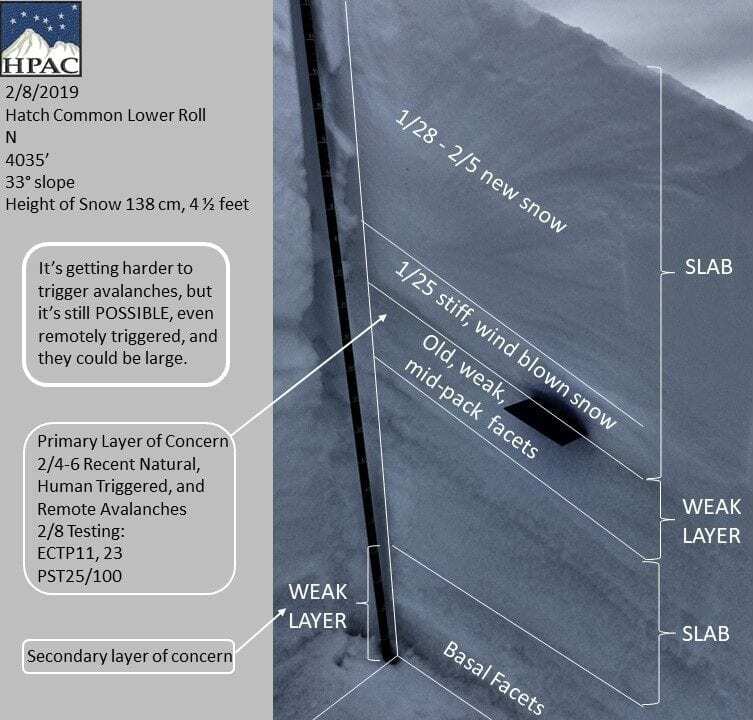 This avalanche is estimated to have failed under the 1/25 old wind slab sitting on faceted, weak snow in the mid-pack (see cross section picture below). Early morning 2/5 brought a small dump of new snow, 4-6” with some wind, which was the straw that broke the camel’s back and tipped the balance. This additional load triggered some natural slab avalanches on deeper weak layers up to 3 feet deep. These deep layers are the same culprits from avalanches earlier in the season, such as the partial burial on Hatch Common, on December 9. 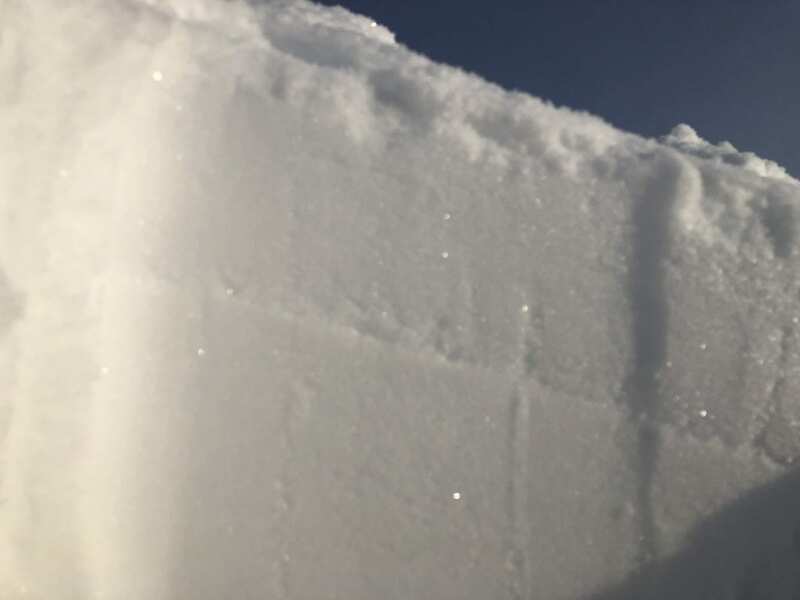 And Wednesday 2/6, avalanche activity continued, with a remotely human triggered avalanche on a Northerly aspect on Idaho peak, which sympathetically triggered a second avalanche of greater size adjacent to the first. These avalanches appear to also have failed on deep weak layers in the snowpack. We are dealing with a heavily flawed snowpack. No single snowpack test will be reliable and tracks on a slope will not equate to stability. 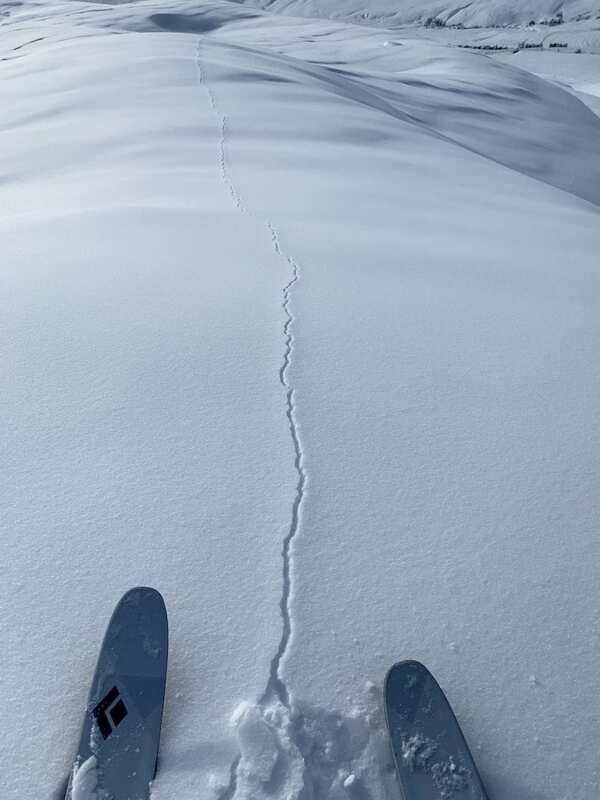 All it will take is finding the right spot to trigger a large avalanche. Yesterday snowpack testing revealed some amount of improving stability, but still showed propagation potential, which equates to avalanche possibilities. We recommend playing it safe, limiting our exposure to the avalanche problem, and staying on the conservative game plan. For today, we recommend smaller scale slopes, and lower slope angles. Choose slopes lacking terrain traps. Space partners far apart, both on the way up and down, and always carry a shovel, probe, and active beacon. Hatcher Pass received about 16" of new snow this week on 2/2- 2/3 and 2/5. 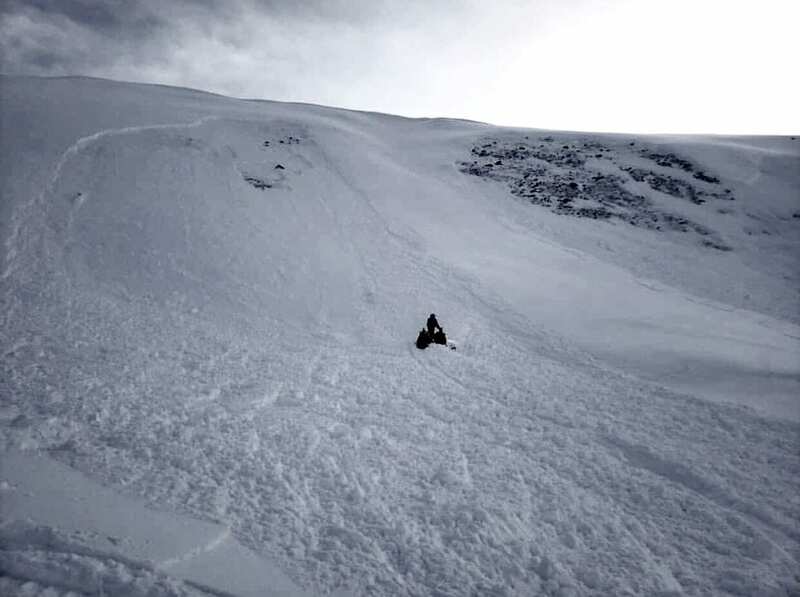 New snow and wind contributed to tipping the balance in the snowpack, resulting in numerous slab and dry loose avalanches. The majority of the naturals occured on 2/4 and 2/5, with one remotely triggered slab avalanche reported on 2/6. These avalanches failed in three locations in the snowpack: 1) storm snow 4-6" deep on buried surface hoar and/or a crust on all aspects (most observed on SE through SW aspects) on slopes above 35º, and 2) 1-2 feet deep slabs failing on old weak mid pack facets, mostly on west through north aspects, on slopes above 35º, and 3) 2-3 foot deep slabs, in some cases remotely or sympathetically triggered, failing on weak facets close to the ground, generally West to North aspects, previously windloaded, on slope angles estimated at 35-38º. Loose dry naturals were observed on all aspects, on slopes above 35º. Also noteworthy...a slab avalanche (SS-ASu-D2-O) was unintentionally human triggered on 2/4 on the W/SW aspect of Marmot. This person was caught, carried, pulled their airbag, and buried up to the chest. 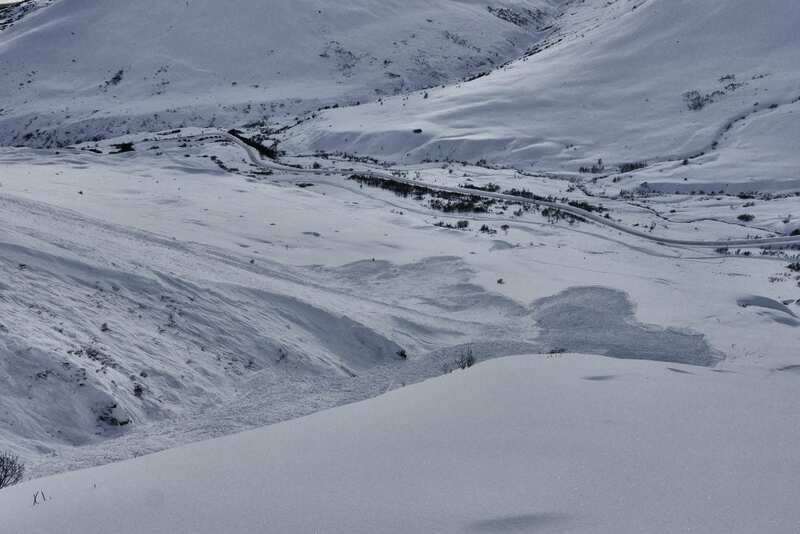 While being carried, another avalanche was sympathetically triggered, increasing the size, amount of debris, and consequence of this avalanche. The victim was reported uninjured. 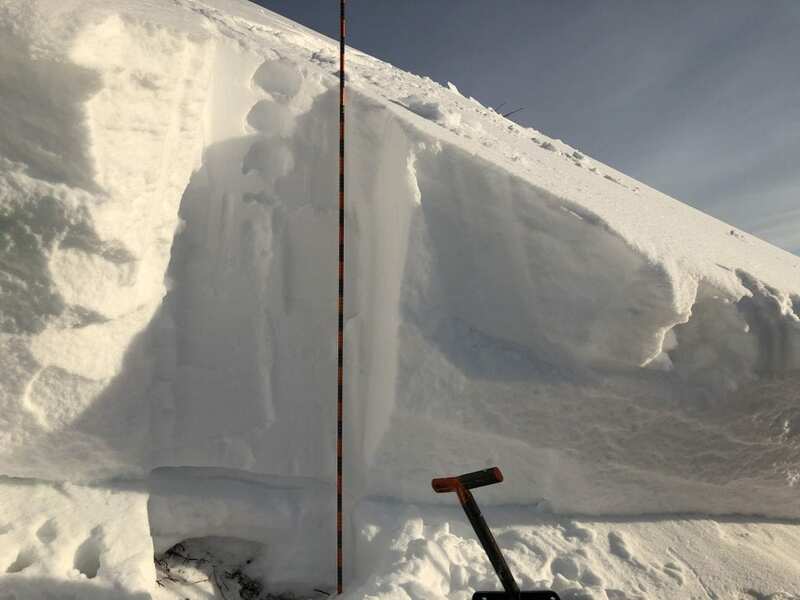 Above: Crown cross section from avalanche labeled "B" in previous picture, showing an old wind deposited hard slab sitting over a relatively thin layer of weak snow. 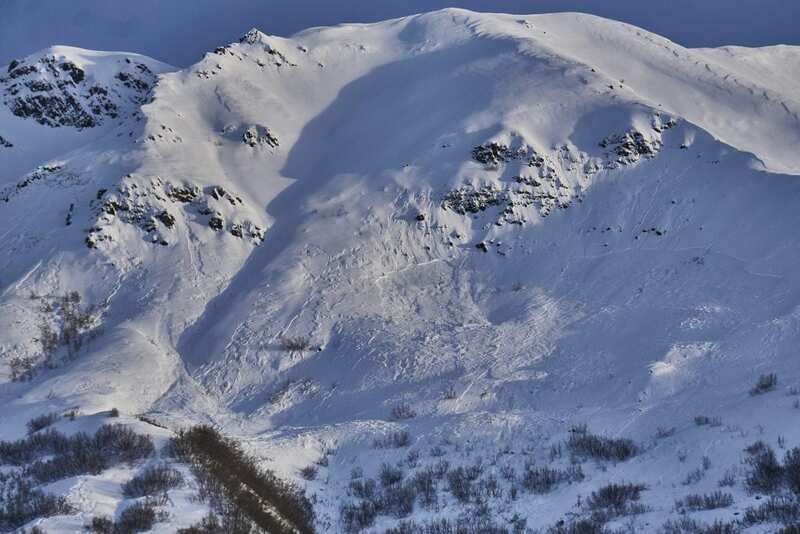 Above: Debris from Death Gully avalanche, and additional subsequent, shallower avalanche on the SW nose feature of the Death Gully. Above: 2/5 - Near Punk Spines, NW, 3200', natural slab avalanches, one with wide propagation. Above: 2/5 - Marmot, SW, 3000-4000', Many thin, shallow, widely propagating, 4" soft slabs, failed on BSH that formed between the 2/2-3 storm and the 2/4-5 storm. Since the avalanche activity on 2/4-5, just after the storm, this layer has stabilized relatively quickly. 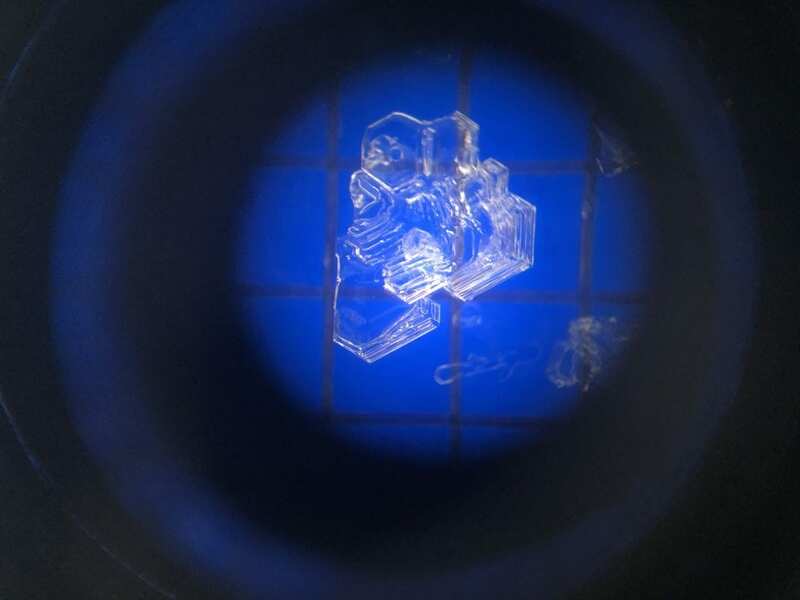 This is likely due to layer penetration of the surface hoar into adjacent soft snow layers. 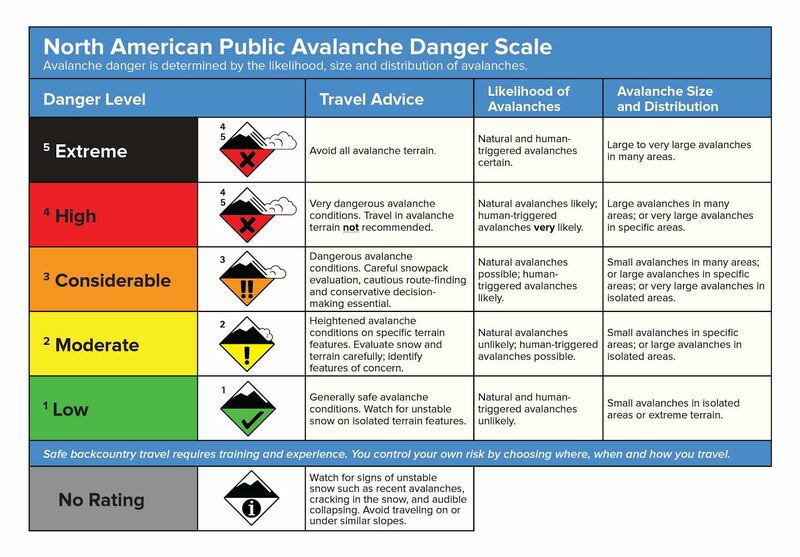 Currently this is not a primary avalanche concern. Above: A thin line is visible in snow pits marking the 2/4-5 BSH. Notice it is very close to the surface of the snowpack. Above: 2/6 - Idaho Peak, North aspect, 4000'. Estimated to have been a remotely triggered avalanche which sympathetically triggered a second avalanche adjacent to the first. The reporting group indicated that this slide covered the their tracks from earlier in the day. They believe they were the only group in the area, and remotely triggered it from the an area near the base of the slope. They did not see it happen. The avalanche failed on weak layers near the base of the snowpack, and was large enough to bury, injure or kill. No one reported to have been caught, carried, injured, or buried. Thanks to mtf_alaska on Instagram for sharing their photo. Above: 2/7 - Subsequent to the last two snow storms, and in defiance to the cold temperatures the weather stations reported, widespread "drizzle" crusts formed up to at least 5000´ on the snow's surface. These layers are currently not an avalanche concern, but once buried could become breeding grounds for thin, weak, faceted layers in the snowpack in the future. This crust has gained strength over the last few days, and in this picture, made a shooting crack. This shooting crack is only in the crust layer and does not represent a deeper shooting crack in the snowpack that would otherwise be a huge red flag for avalanches. It's more like a stale candy bar with a brittle outer coat. Temps averaged 23ºF, with a low of 19ºF and a high of 32ºF. 16.25" of new snow accumulated this week with 1.74" SWE. Temps averaged 21ºF, with a low of 14ºF and a high of 27ºF. Winds averaged SE 5 mph, max 14 mph . Gusts averaged SE 8 mph, max gust SE 21 mph. Temps averaged 28ºF overnight, with a Low of 23ºF. Winds averaged SE 3 mph overnight. Max gust E 10 mph. Mild temperatures, light winds, and very little to no precipitation is forecasted for this weekend. 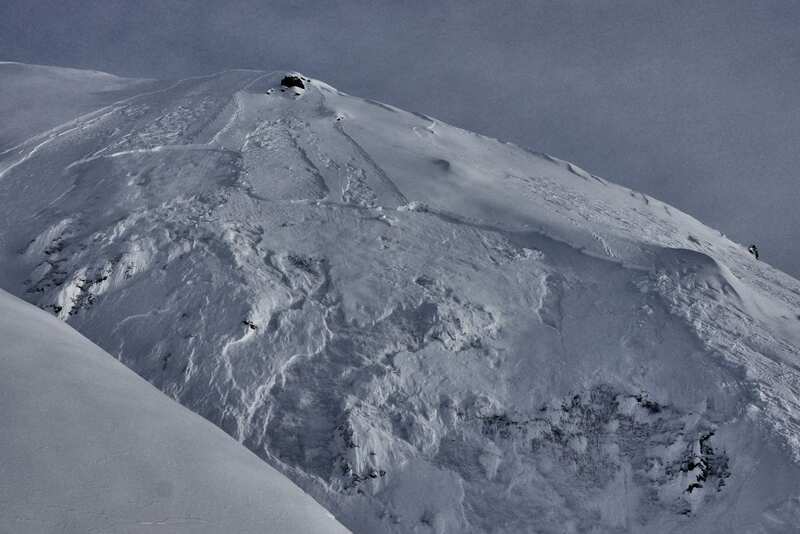 The avalanche hazard is expected to remain the same through the weekend. Thank you to our community for coming out to the annual HPAC Cabin Fever Reliever Fundraiser. It was a success! Congratulations to Joe Metzger for winning the BD Pieps Beacon and thank you to Black Diamond Anchorage Retail Store for supporting HPAC!